Teavivre has kindly sent me some new teas to sample, and I thought one of the packets had an odd shape to it, so I checked it out and inside found this! 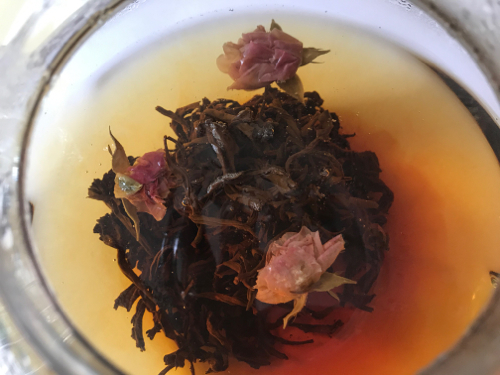 As you can probably guess from the title of this post and from the picture of the ball of tea above, this Rose Dragon Ball Black Tea includes black tea and roses. 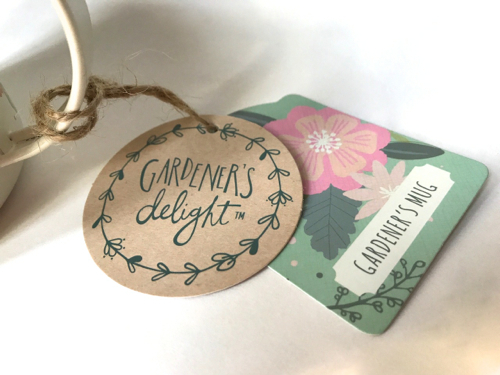 Remember how artisan floral teas were all the rage a few years ago? I'd forgotten about them, so it was lovely to open this ball of tea leaves and discover the pretty rosebuds drifting off as the tea steeped in my glass teapot. The taste, however, is what impressed me most about this tea. I was expecting a heavy perfumed taste because of the rose, but I found only the merest hint of rose in this tea. Mostly I tasted a very fresh, very brisk (but not astringent) Yunnan tea with its characteristic malty notes. 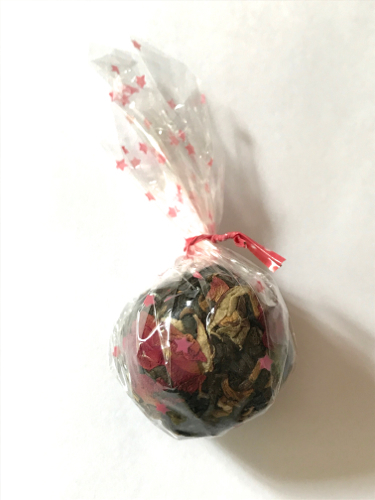 According to Teavivre, the Rose Dragon Ball Black Tea is made from Yunnan large-leaf species of old tea trees. These old tea trees are between 50 and 300 years old. (Tea trees over 300 years old are considered to be "ancient" tea trees.) I greatly enjoyed the taste of this tea from "old tea trees," and I had several cups of it. Since I've sipped lots of flavored teas over the past week, a quality black tea seemed to be just what I was looking for, and I appreciated both the taste experience and the aesthetic experience of this lovely new tea. 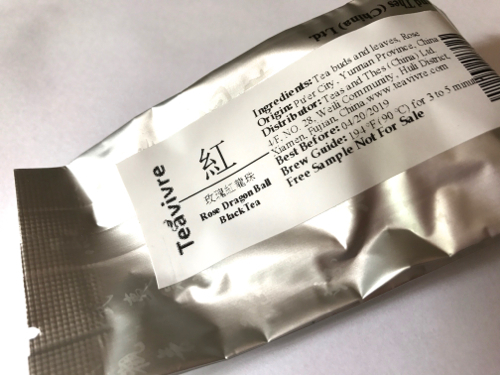 Go here if you'd like to learn more about Teavivre's Rose Dragon Ball Black Tea. 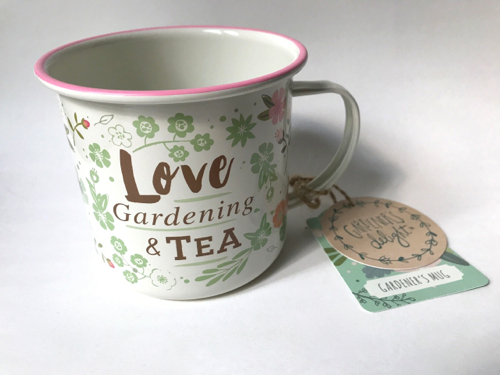 A tin tea mug for garden lovers! For a couple of months now, I've noticed that the Peachtree City T.J. Maxx has had some cute $4.99 tea mugs made of tin. I've really tried to put the brakes on acquiring many more teacups and tea mugs, but I was in the checkout line at T.J. Maxx this week when I saw one of these mugs that I just couldn't leave behind! Even the tags on this mug are cute! The back of the tag tells me that this mug of powder-coated steel should not be used in the microwave (not a problem), and it's a copyrighted design from Bell & Curfew, a company in Bath in the UK and Brooklyn, N.Y. I did wonder whether the handle of a tin tea mug filled with tea would be too hot to, you know, handle, but it wasn't. I wish I'd seen a few more of these mugs since I have a few friends they'd be perfect for, but alas, there was just the one. If you'd like one for yourself, though, be sure to check out the checkout line at your local T.J. Maxx! Could you use a little art and inspiration in your life this week? If so, I am delighted to recommend a new book I recently ordered thanks to an Amazon gift card my sister gave me for my birthday. 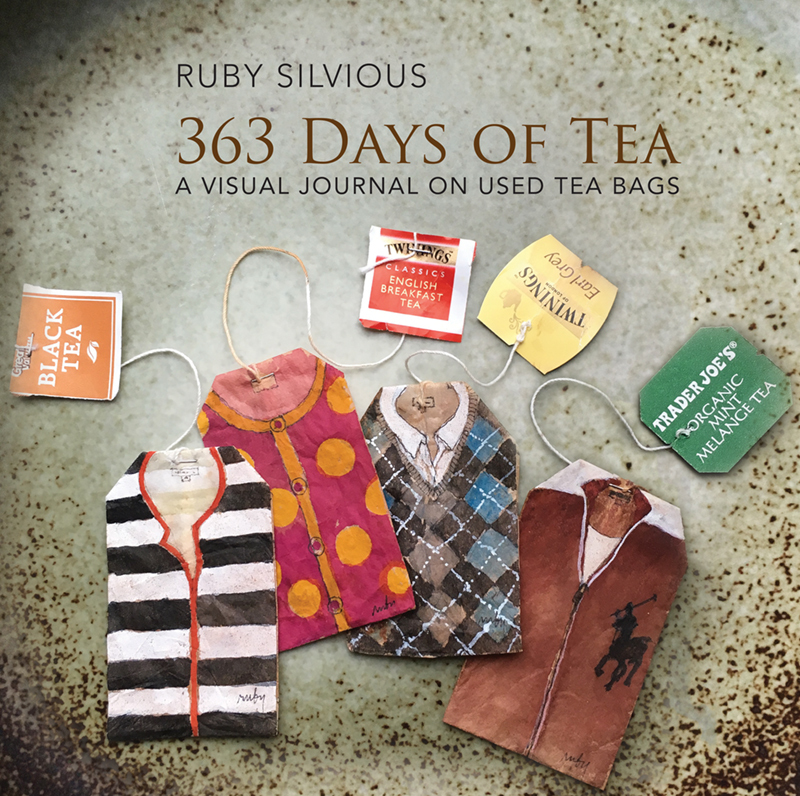 It's the book 363 Days of Tea by Ruby Silvious, and it chronicles the author's 2015 project of creating a new piece of artwork each day for a year with a used tea bag serving as her canvas. I've seen a few projects like various "dresses" that incorporated used tea bags, but Silvious has taken tea bag art to an entirely new level! 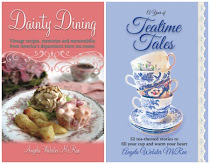 Tea lovers will enjoy this book for its tea information as well as for the beautiful artwork. For instance, I enjoyed examining all the hang tags and noting which teas I have tried and which I have not. 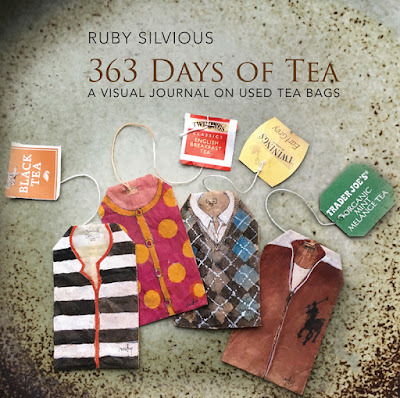 Silvious has also made me consider my lowly tea bags in a new light. 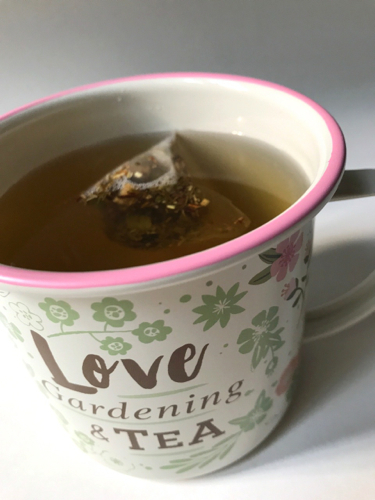 Have you ever thought about which tea bags have the most distinctive stains? Or which teas stick to the bags? She writes, "Over time, I learned the different tea bag shapes and constructions as well as the kinds of stains different teas produce. For instance, chamomile tea leaves stick to the tea bag paper, making them difficult to remove. Some green, white and herbal teas don't stain at all, so I reserve these for painting portraits. When going for distinct contrasts, I use black and rooibos-stained tea bags because they produce the best stains by far." 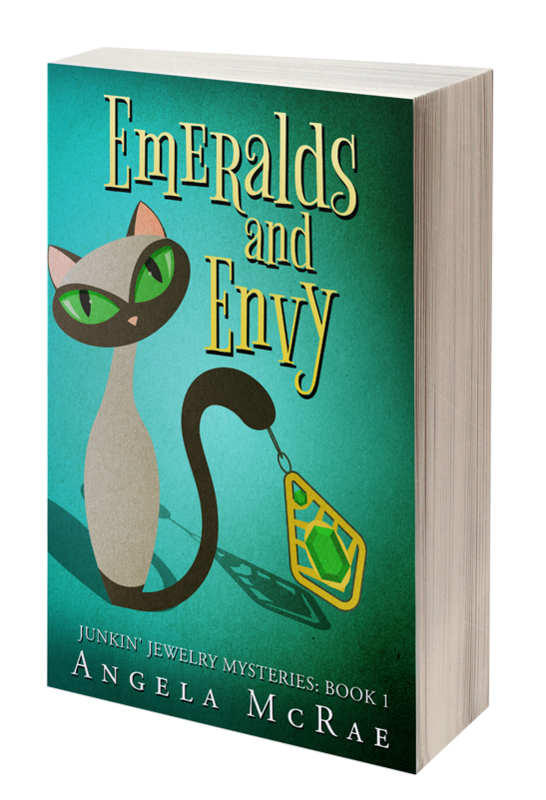 If you'd like to see a sample of the elegant artwork in this lovely book, click here. 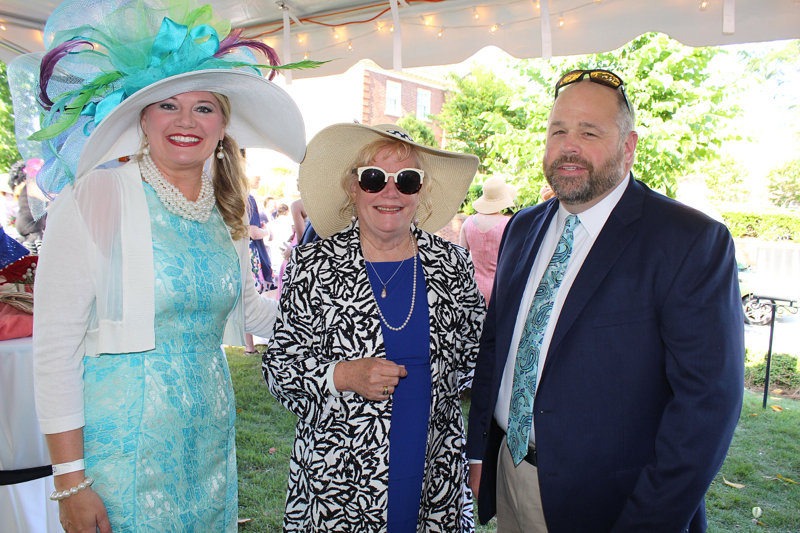 Hats on parade at "Tea With Lynn"
Last Thursday at the McRitchie-Hollis Museum in Newnan, I had the pleasure of attending a program and tea sponsored by the Newnan-Coweta Historical Society, "Tea With Lynn." 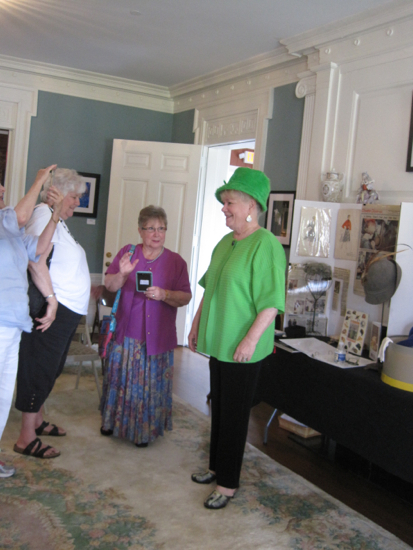 The speaker was Lynn Smith, a renowned local hat collector and beloved Newnan figure. I am quite pleased that Lynn also happens to be our longtime State Representative from Newnan. She works hard, doesn't seek the limelight, quietly reads bills and studies the issues, is well-respected for her leadership on environmental stewardship, and has never embarrassed us. I hope she serves forever. 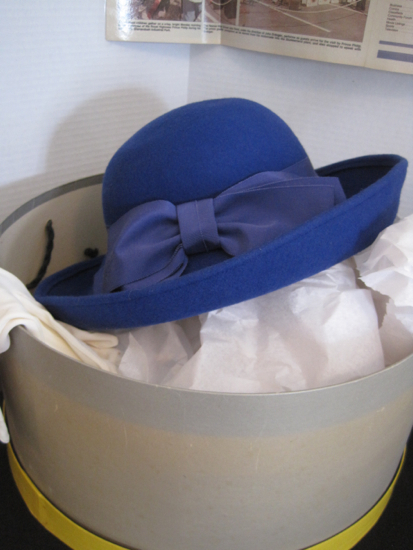 Because Lynn donated her collection of 500-plus hats (many with hat boxes) to the historical society, they have a special exhibit of her hats on display. When I was a newspaper reporter many years ago, I actually interviewed Lynn about her collection, so I've followed with interest her adventures in hat collecting. 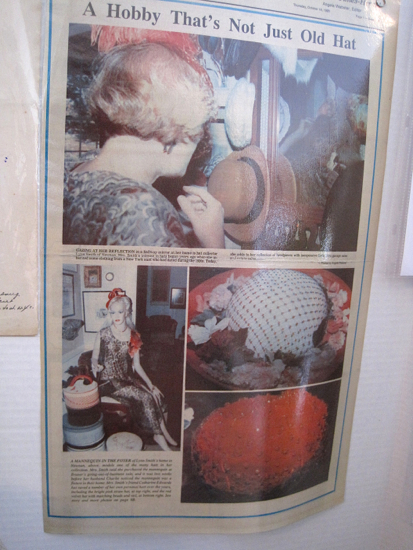 Her display at the museum chronicled some of her collection, and this laminated feature page from 1990 looked familiar—and that's because I took the photos! I was intrigued to learn about Lynn's early hat-collecting influences, such as her "Aunt Rosemary," who used to sweep down from New York, swathed in mink from head to toe and making an impression on her young niece. Lynn said she learned about fashion from her aunt, and she learned how to shop the great New York department stores—you shopped in the basement where things were more budget friendly. 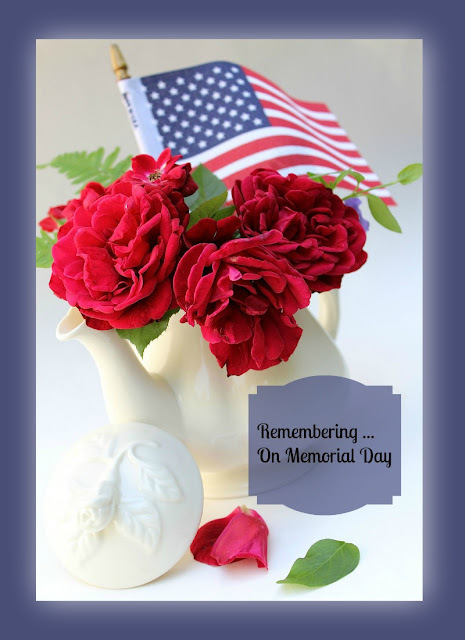 Lynn's husband was in the military, so as a young bride she learned to stretch a budget. 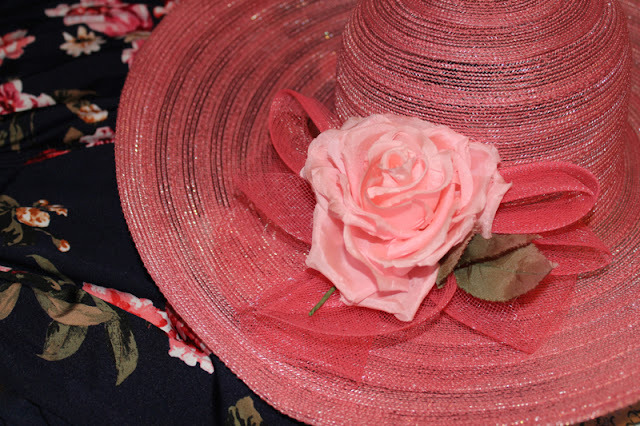 She said she visited estate sales and garage sales to find items for her home, and it was there she began to notice old designer hats for as little as a dollar. By that time few women wore hats anymore, so she started collecting them. And as we all know, one collection leads to another. 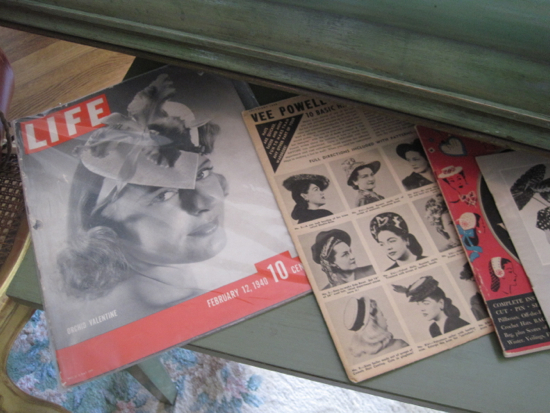 Lynn also collected magazines and books featuring hats. 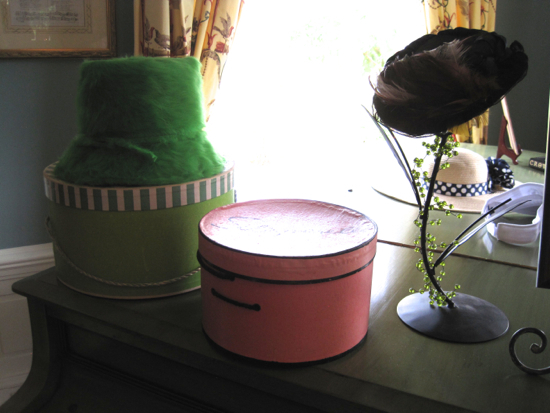 And even some artwork of hats and hatboxes. 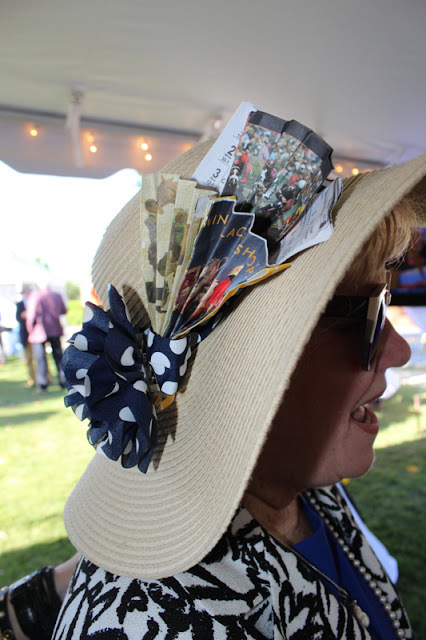 One of the most special "hat stories" she told was of one I knew about but had forgotten. In 2000, Lynn was chosen to greet Prince Philip when he came to Newnan to open the Slumberland USA mattress manufacturing facility. 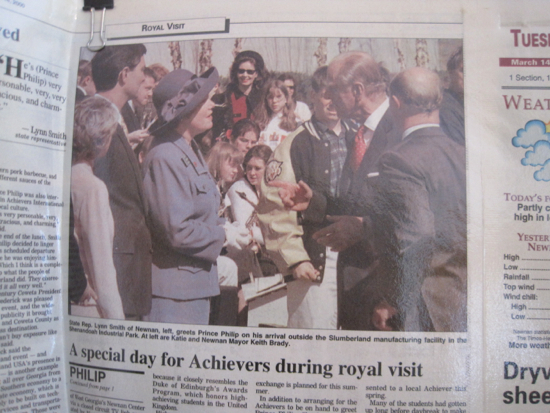 As the highest-ranking elected official in town, Lynn was contacted by the British embassy, and someone politely suggested that it might be appropriate if she were to wear gloves and a hat when she greeted the Prince. The gloves were actually pretty easy to find, she said, and she eventually found a hat that matched the suit she had chosen to wear. 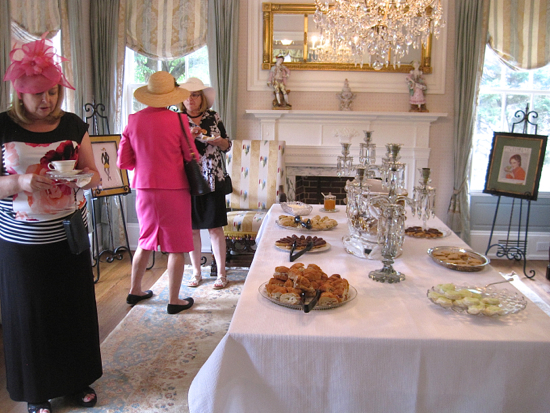 After her program, the several dozen women in attendance got to ask questions, tour the house and hat collection, and partake of teatime treats courtesy of the historical society. 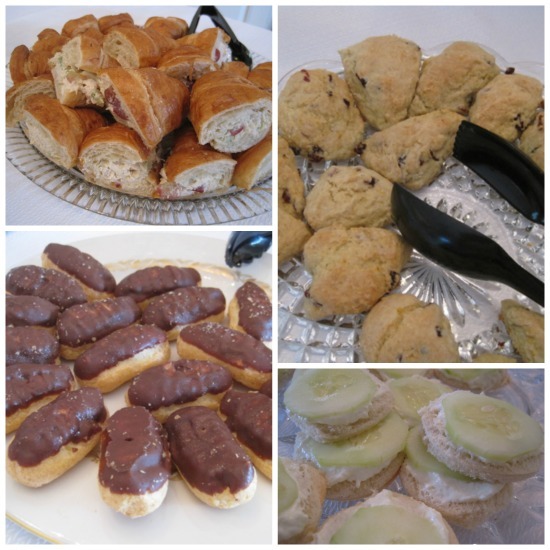 We got to enjoy selections of Twinings Tea along with chicken salad and cucumber sandwiches, mini eclairs, delicious scones served with jam and cream, and some shortbread. What a great way to celebrate an afternoon with a lovely woman and her lovely hats! Farrah G.! And Farrah, I've just sent you an email requesting your snail mail address, so once I receive that, the book will be on its way. With over 100 entries, this giveaway was one of the most popular ones I've ever offered. 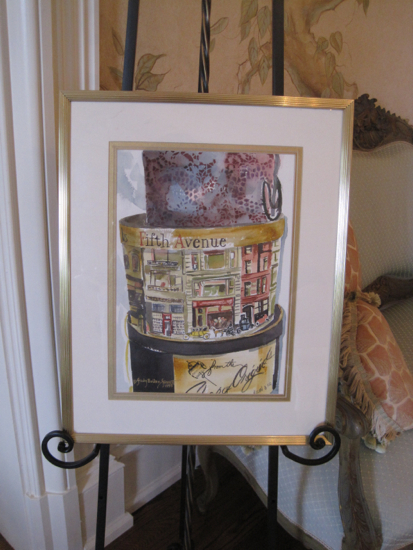 Clearly, I need to give away more Susan Branch merchandise, so I'll be on the lookout for more! Are any of you twins? Do any of you have twins? I think most of us are probably fascinated by twins. My paternal grandmother, Ruby, was a twin. Grandmama Ruby had eleven children, including my father, but none of them had twins. Grandmama Ruby's twin sister, Ruth, had only one child. Now isn't that interesting? I was at a family reunion last year and asked some of my aunts and uncles (nine of the eleven are still alive) which twin was the oldest, and no one knew! But enough about twins in my family. I found some darling twins on the Library of Congress website that I wanted to share! 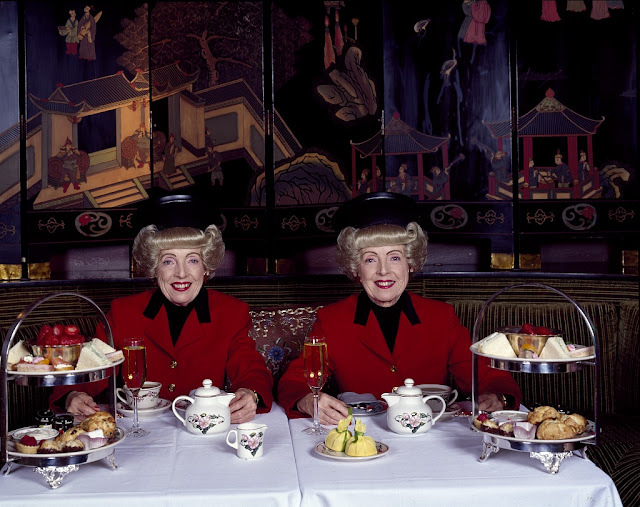 It's usually only the older photos that are in the public domain, but this image now appears on loc.gov and is titled, "San Francisco, California's most famous twins, Marian (left) and Vivian Brown, photographed in the 1990s, enjoy afternoon tea." Aren't they darling! I wonder what kind of caps they're wearing. Apparently the two were known for dressing alike. Go here if you'd like to learn more about the late Marian and Vivian Brown. So this week Alex and I have had the pleasure of enjoying a few days at a friend's condo in Orange Beach, Alabama. 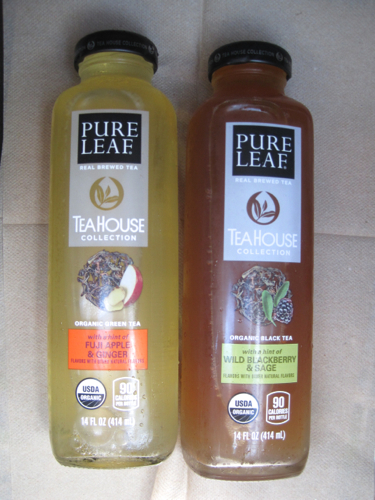 On the way down, I happened to be reading a new magazine and saw an ad for a new collection of teas from Pure Leaf called the Tea House Collection. I mentioned that I wanted to look for them on the trip, and to my surprise, the very next store we stopped at had them! (It was one of those nice huge convenience stores with a deli and a Cinnabon vendor inside, but still, I was surprised at how easy it was to find these.) I loved the modern looking glass bottles, and the flavors all sounded intriguing, but I limited myself to two. The first one I tried was the Fuji Apple & Ginger organic green tea. Sweetened with cane sugar, this drink had a nice sweet but not-too-sweet taste, and I liked the little zip from the ginger. I drank about half of this from the bottle and enjoyed it, and I found I liked it even better when I got to the condo and poured the rest of it over ice. The other flavor I tried was the Wild Blackberry & Sage organic black tea, and I had this one entirely with glasses of ice. I found that "hint of wild blackberry and sage" is accurate, but I did enjoy the mildness of the flavor. I would have to say that these two teas come pretty close to approximating a genuine freshly made iced tea, and I'll be trying the other flavors soon as well. Have any of you tried these teas? If so, what did you think? You can read more about these teas here. 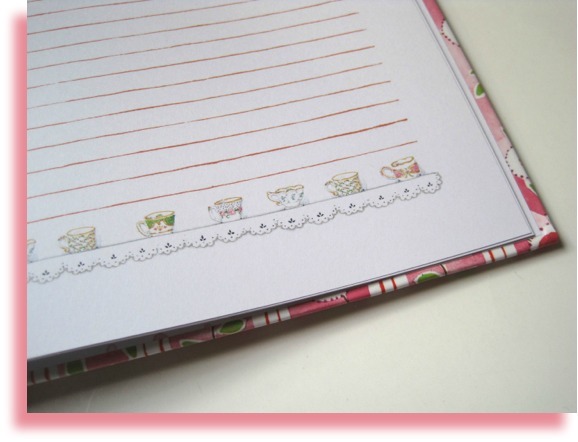 May Giveaway: Susan Branch Guided Journal with Teacups! I suppose Barnes and Noble had these out the other day in preparation for Mother's Day, but it also struck me that this would be a great giveaway item for May. 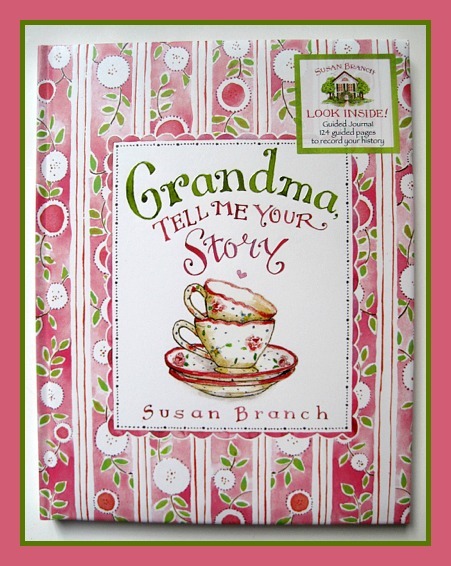 Many (perhaps most) of you are mothers and/or grandmothers, and I think it would be lovely for one of you to have this beautiful teacup-embellished journal to fill in as a keepsake for a) your grandchildren or b) your future grandchildren! 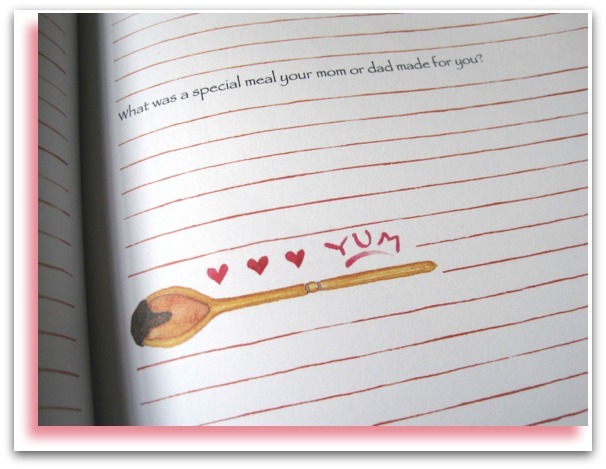 The journal includes some fun prompts to get you started. And there are also blank pages featuring artwork that I suspect will be a hit with some of you. If you'd like to win the journal, just leave an "Enter Me" to this post between now and 7 a.m. EST Friday, May 19. (US and Canada only, please.) Good luck! Now isn't this a *pretty* blend? I think loose tea is as attractive as some potpourri I've seen, and this tea also smelled absolutely divine, like a nice fresh Earl Grey yet somehow not quite as potent as the typical Earl Grey. The ingredients are black tea, orange peels, blue coneflowers, natural vanilla flavor, natural bergamot flavor, and natural creme flavor. 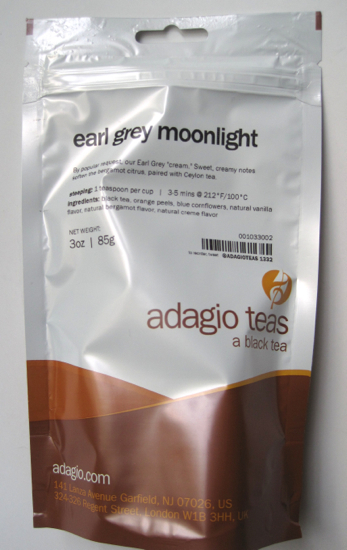 The bag notes, "By popular request, our Earl Grey 'cream.' 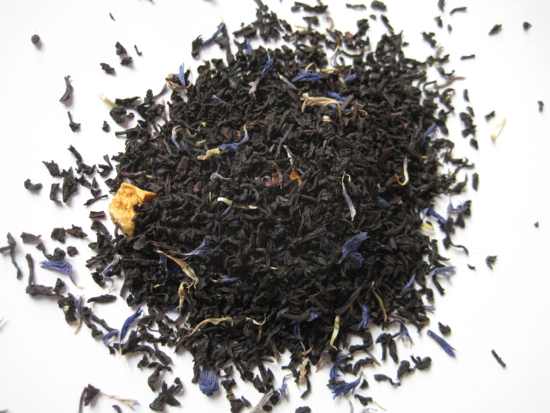 Sweet, creamy notes soften the bergamot citrus, paired with Ceylon tea." And "creamy" and "soft" are the perfect adjectives to describe this tea. I like most Earl Greys I've tried, but I can tell I will be enjoying this one for a long time to come. 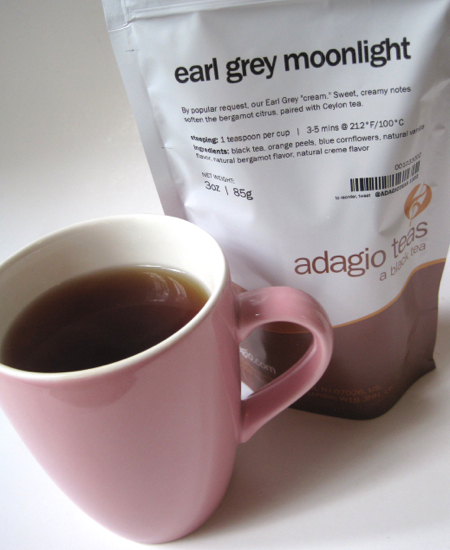 Most Earl Greys make me want to reach for a cucumber sandwich to balance the briskness of the tea, but this one simply tasted like a terrific dessert tea, something I'd be happy to drink at teatime or anytime. Go here if you'd like to learn more. Yesterday I finally made it to Chicken Salad Chick, and I'm now a fan! I first heard of this new Southern chain restaurant a couple of years ago, but there wasn't one nearby. The few times I passed one in the Atlanta area, I was busy shopping and not in the mood to stop by. But one of the restaurants opened in Peachtree City, and I met my friend Ruth for lunch there yesterday. I was eager to go because I've rarely met a chicken salad I didn't like. 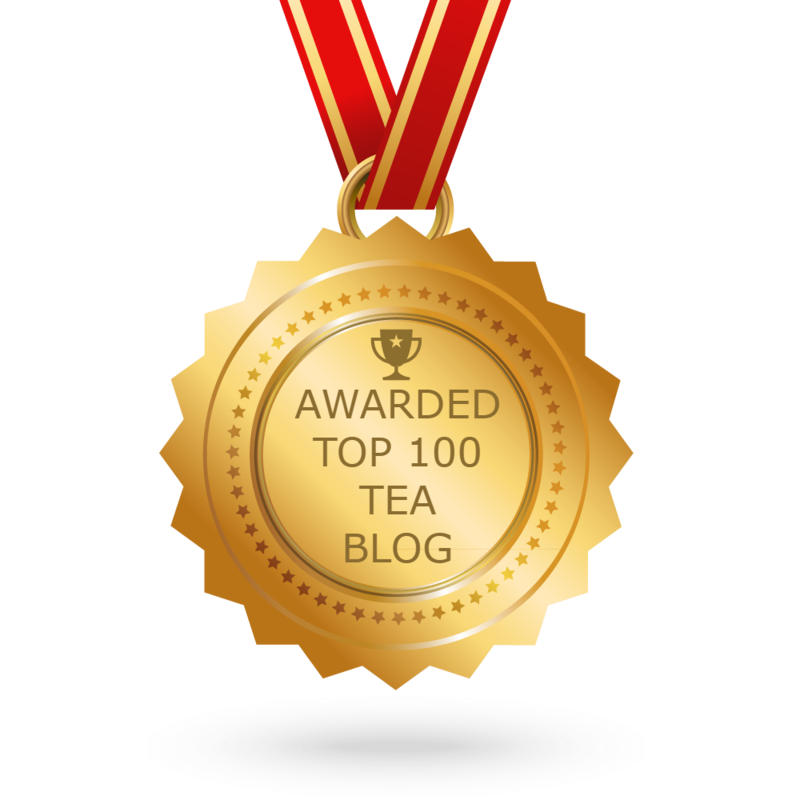 I think if the cucumber sandwich is the number one choice for teatime, then the chicken salad tea sandwich must surely own second place! I knew this place was famous for offering 15 different types of chicken salad, and I wanted to be able to try them all! I looked online and saw that one of the specials included a plate with three different scoops, and I knew that was what I wanted. I had a sandwich for supper the night before, skipped breakfast, and was ravenous by the time lunch rolled around. Even so, I was absolutely stuffed after eating those three scoops, but boy, were they good! I got Carol's Classic (at right, the one that started it all), Fancy Nancy (a fruity one with apples, grapes, and pecans, at left), and the lemon and basil variety in the foreground. I enjoyed them all, and I probably shouldn't be surprised that Fancy Nancy was my favorite since it is most like the chicken salad I make. Also, something about the sweet apples and pecans reminded me of some of the better chicken salad I've enjoyed in tea rooms. 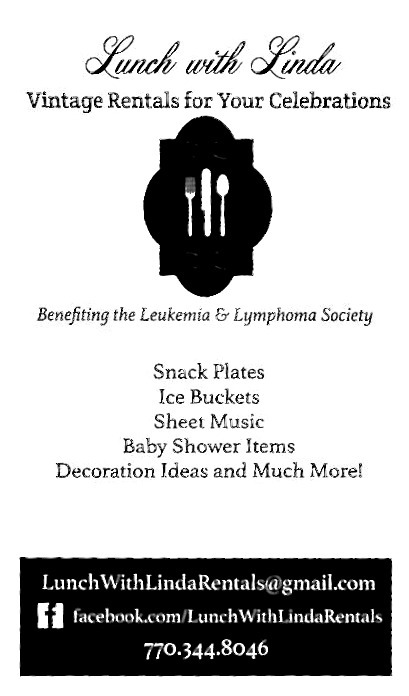 And that beige round item at upper right? It was a super soft, cakelike iced lemon sugar cookie. Wonderful. 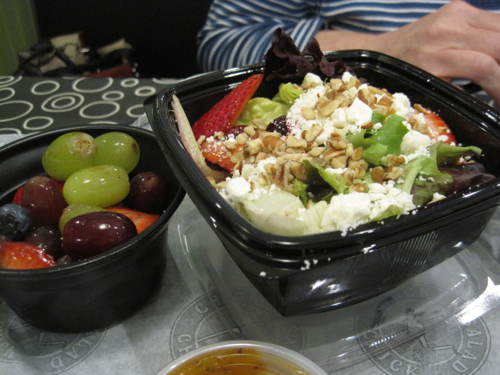 My friend Ruth had a green salad and fresh fruit, which she said was good, but I'm all about the chicken salads. 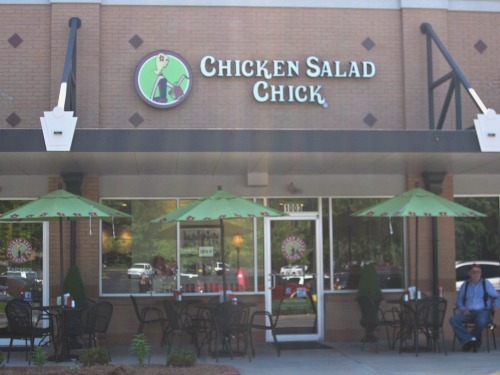 And earlier this year, I learned that Chicken Salad Chick is coming to Newnan soon, so I can look forward to eventually trying the other twelve flavors. (But only two scoops next time. I'm not sure one big meal a day is the healthiest way to eat.) 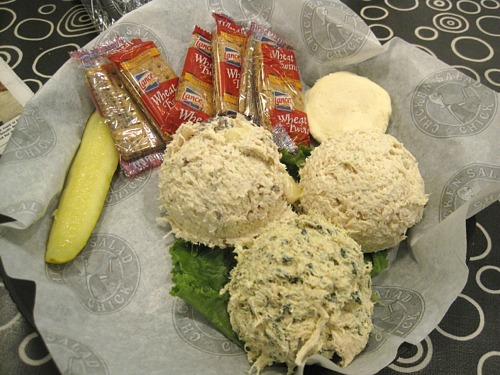 Have any of you visited Chicken Salad Chick? If so, what are your favorite flavors? Go here if you'd like to learn more. 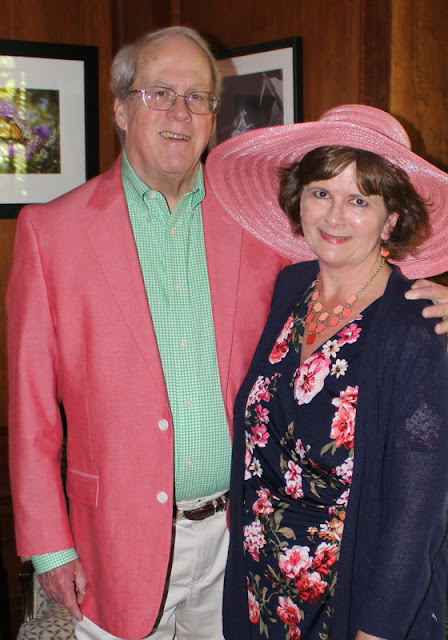 Saturday was the annual Hats and Hooves Derby Affair fundraiser for Communities In Schools of Coweta County, the local dropout prevention program that Alex and I help with their marketing. 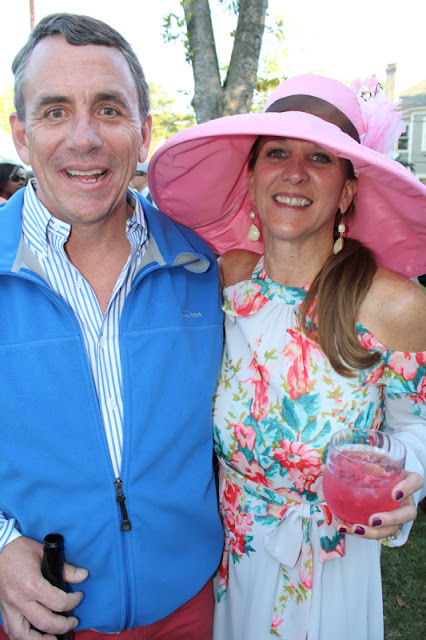 This is our third year to attend Hats and Hooves, and it’s so much fun to show up and see all the pretty hats everyone is wearing. I had a hard time even *finding* a hat to match the coral pink color in my dress this year. I waited too late (early April) to buy one online, and all the ones I really liked seemed to be in China and wouldn’t arrive until the end of May. I finally found this one at a shop in Carrollton, and it was fine but not spectacular. So I got home Saturday night and started looking for next year’s hat! 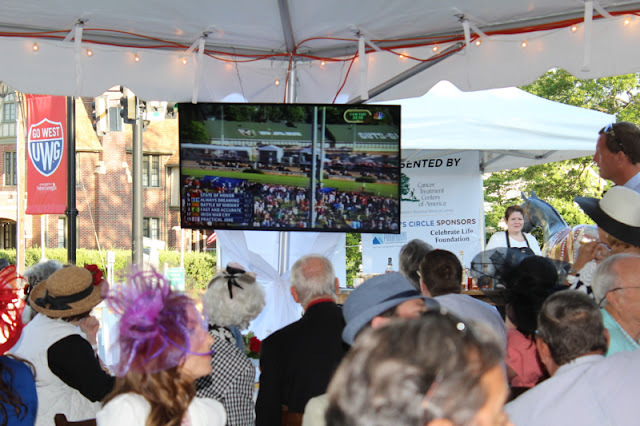 Obviously many of the women in attendance had no problem finding a great hat, and I didn’t want to be rude and say, “Where did you get that?” So if you know where to buy a stellar hat for next year, I’m open to recommendations! 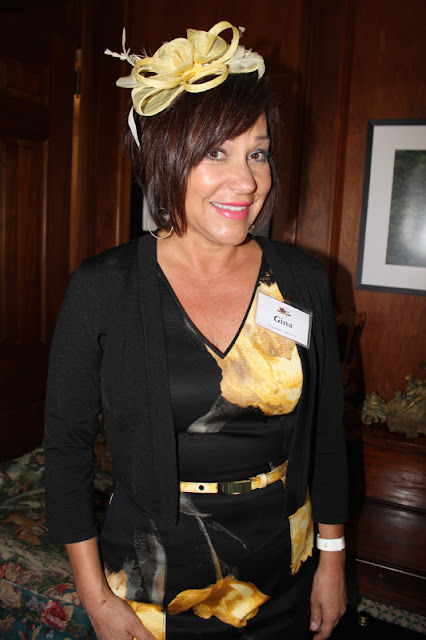 This is our sweet CIS exective director, Gina, who once again chose a fascinator. 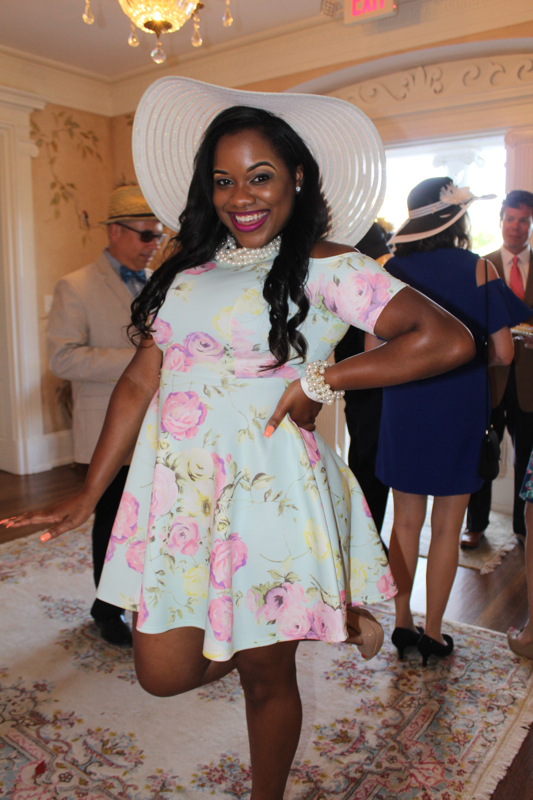 She is one of those women who looks great in whatever she wears! 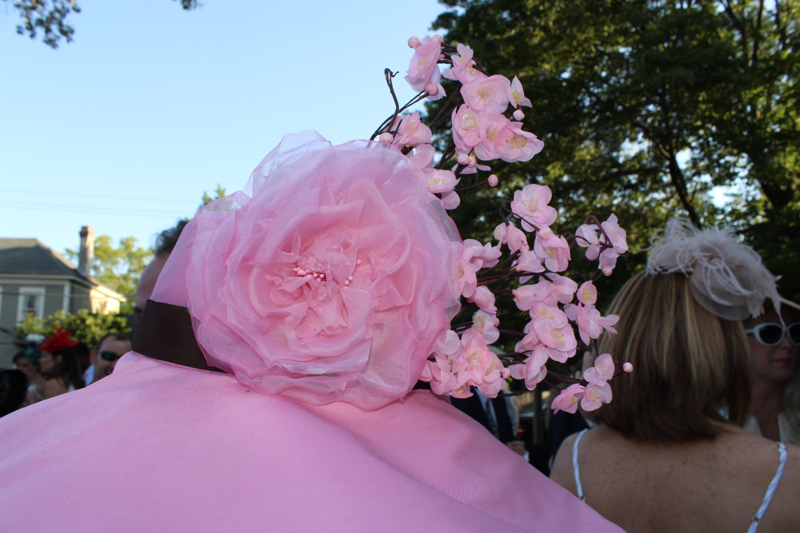 Lynn’s Derby Day hat cleverly had a racing form (is that the right term?) worked into its design. Fun! I've become friends with the talented (and beautiful) Bri from my work at the Newnan-Coweta Chamber, and she is such a good sport. I asked her to strike a pose, and she said, "How's this?" Perfect! Another of my favorite hats belonged to my friend Sandee Crain, shown here with her husband, Joe. When I was a newspaper reporter many moons ago, we started an annual bridal section, and Sandee and Joe were my first bridal couple to star in an entire section of the newspaper. I have always taken great pride in the fact that they’re such nice people and terrific leaders in our community. Here’s a detail from Sandee’s pretty pink hat. And now, let's talk a little food. 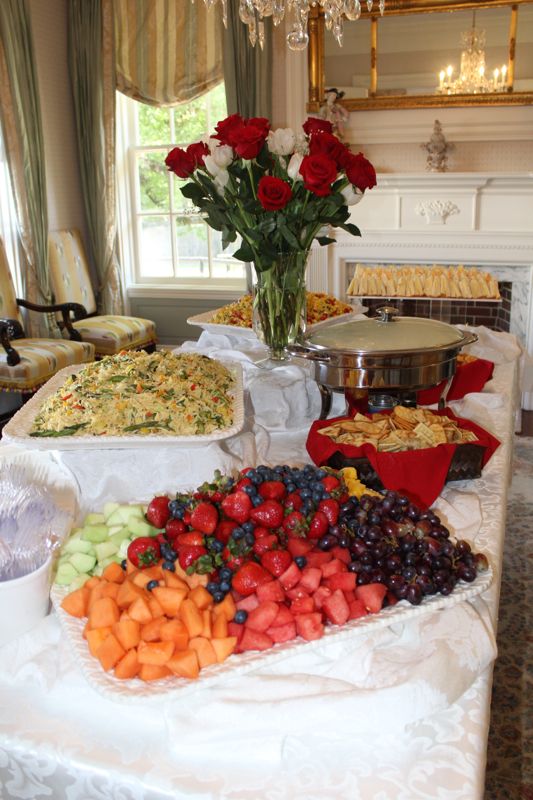 Isn’t this buffet table at the McRitchie-Hollis Museum lovely? 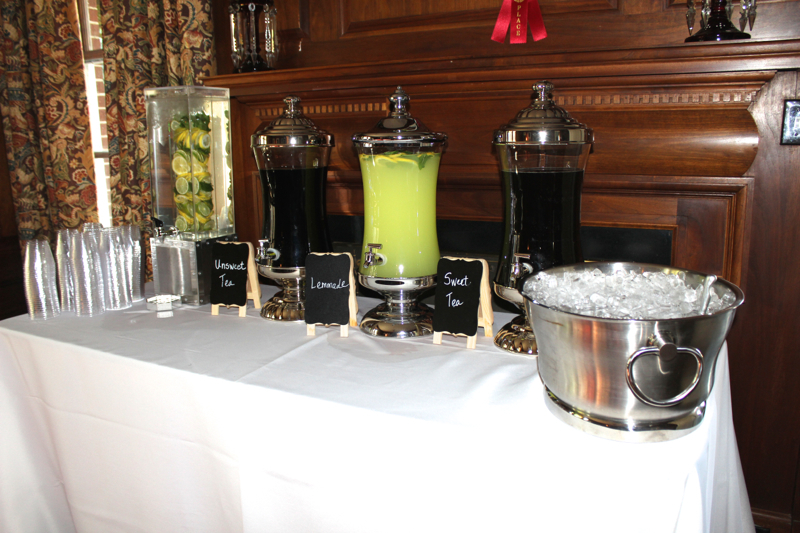 The mint juleps were being concocted outside, and inside, I made my own mixed drink, an Arnold Palmer, at the tea bar! 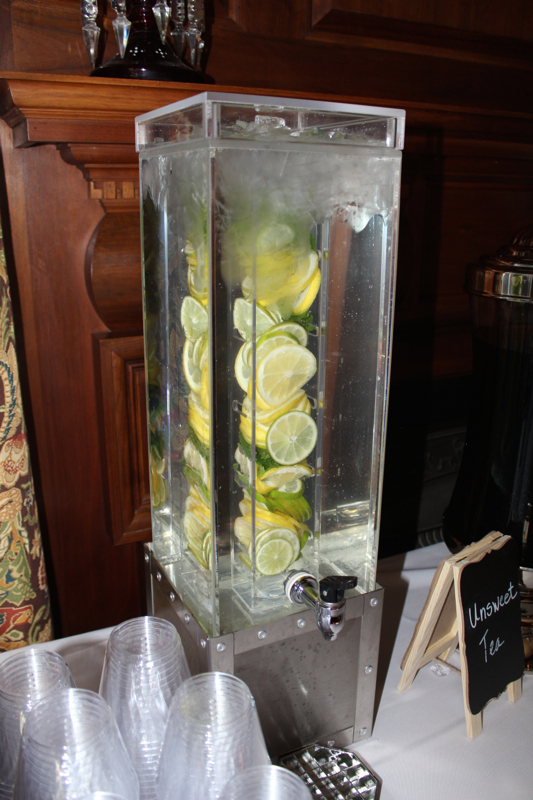 By the way, don't you love how often we're seeing fruit-infused water these days? I really liked this presentation. 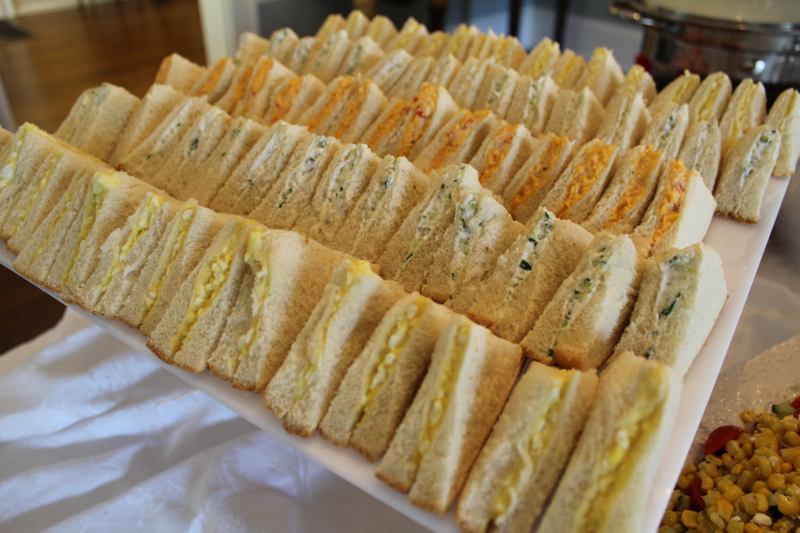 I was happy to see the tea sandwiches. I ate one of the cucumber sandwiches, and it was delicious. The heavy hors d'oeuvres all looked wonderful, but I was saving room for the sweets, which are always outstanding. 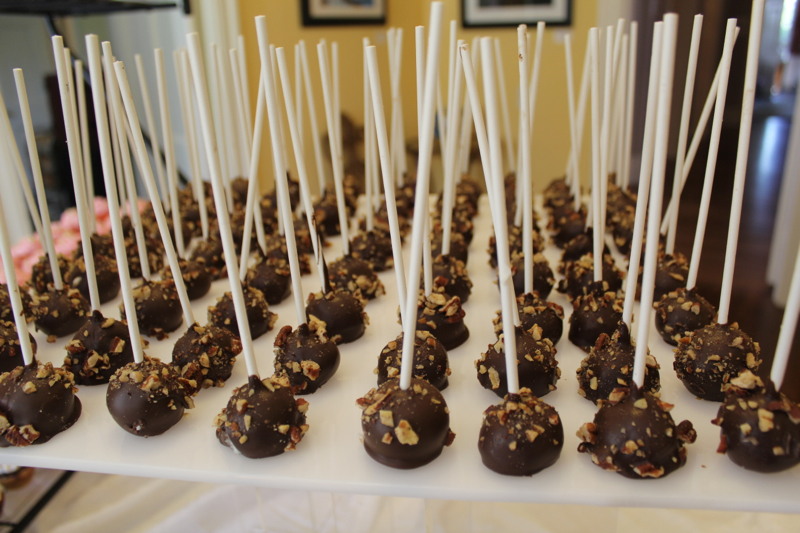 This year, I saw what I thought were cake pop-style bourbon balls, but someone said they were rum balls. My stomach wasn’t as hungry as my eyes, alas, but I did try these two goodies, some sort of sweet cake with iced topping (dates and nuts, maybe?) 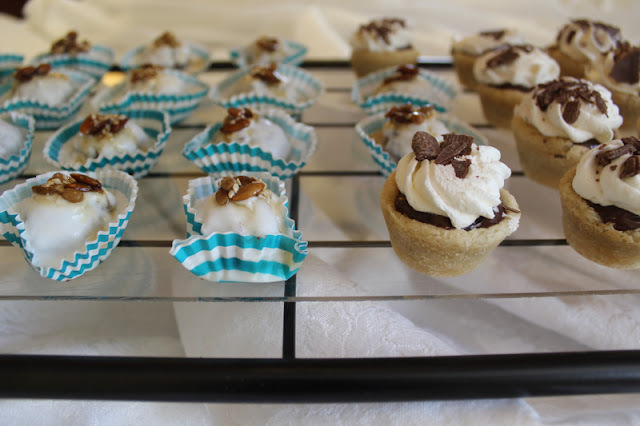 and a chocolate tart with whipped cream and chocolate shavings. These were my favorites. 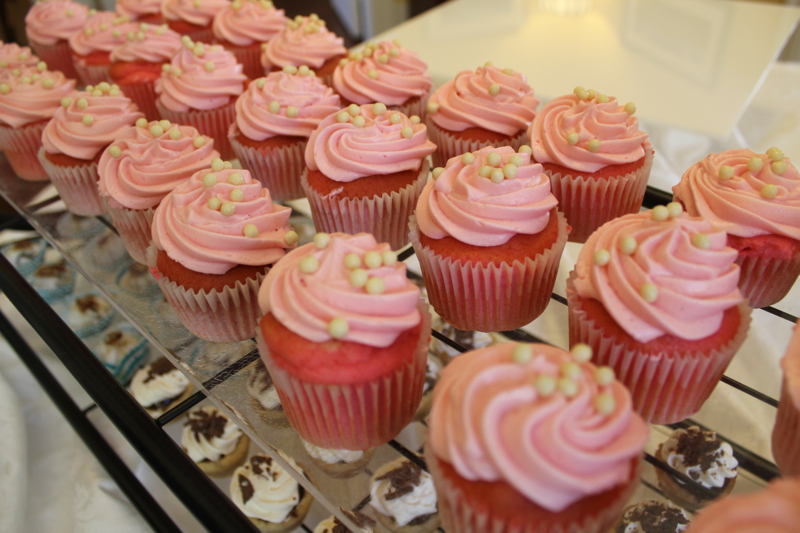 Pink cupcakes made for a pretty display. 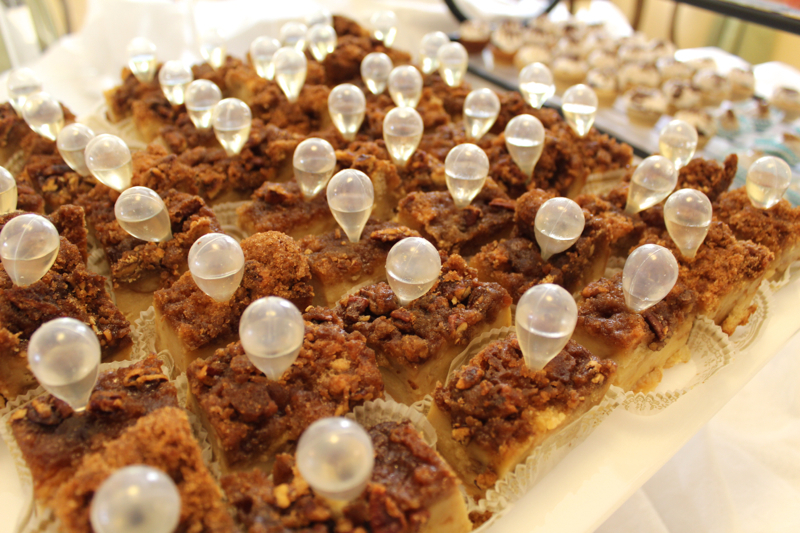 But the sweet that made the biggest impression? At the end of the night I was absolutely pooped when the dress and hat and high heels came off, happy but tired. 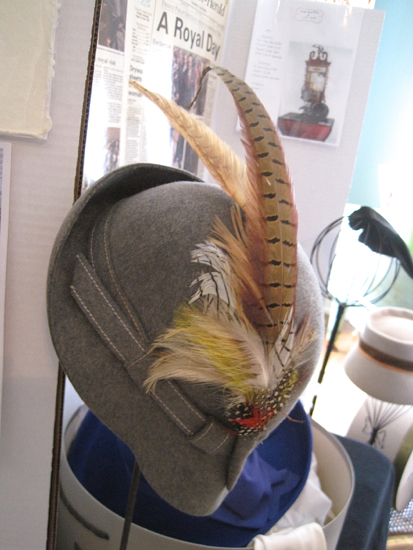 And ready to start thinking about next year's hat! 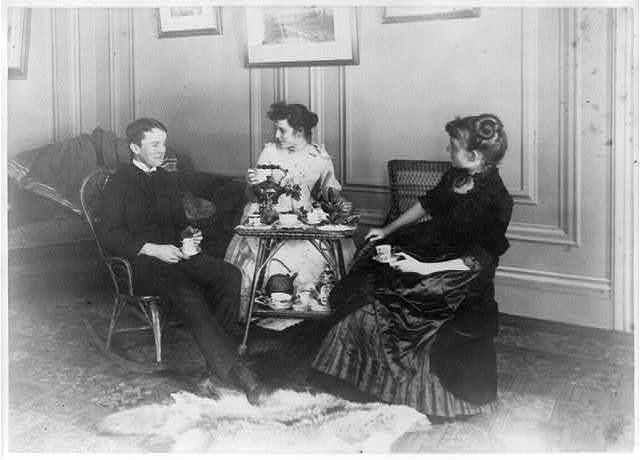 After realizing I'd let a few weeks go by without checking the Library of Congress website for new tea images, I was intrigued to see that a new collection has been added, the work of Frances Benjamin Johnston, who was described as one of the first American women to gain prominence as a photographer. 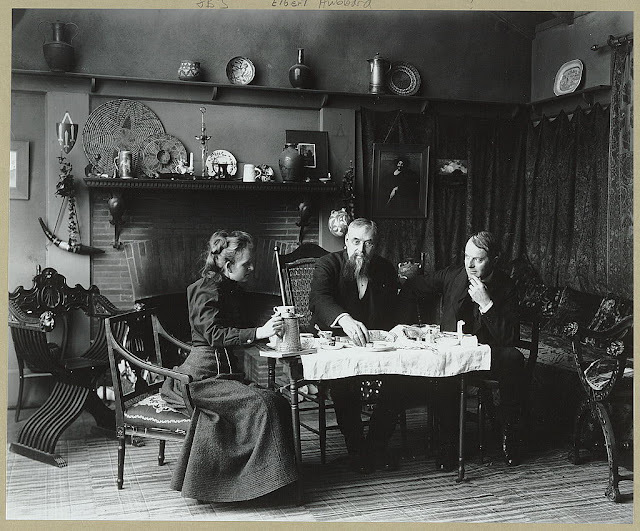 According to the Library of Congress website, "Trained at the Académie Julian in Paris, she studied photography upon her return to Washington, D.C., in the mid-1880s and opened a professional studio circa 1890. Her family's social position gave Johnston access to the First Family and leading Washington political figures and launched her career as a photojournalist and portrait photographer. Johnston turned to garden and estate photography in 1910s." So ... is Frances the woman in the middle or the woman on the right? There's no date or other information recorded, so I was left to puzzle over this. So now I'm thinking Frances was the woman at right in the first photo. Do you agree? At any rate, I greatly enjoyed flipping through her collection of photos on the Library of Congress website, and you can find it here.